Life, decay and change. 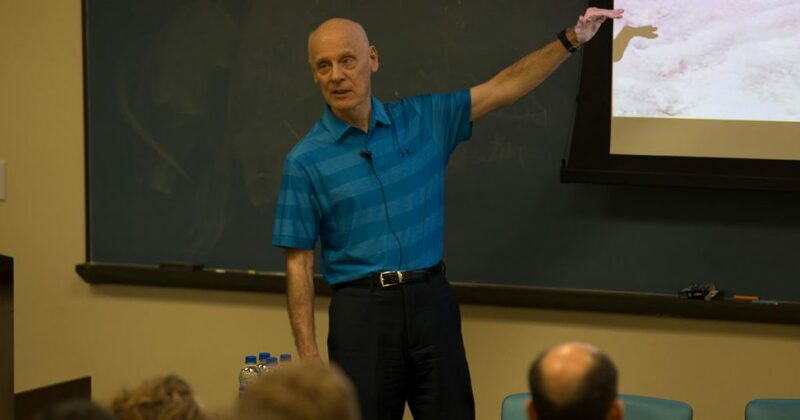 It’s all part of the world we live in — a world made just for us, down to the very molecule, as Dr. Hugh Ross pointed out in a talk with students on Wednesday, April 4. A close look at creation, at the intricacies of nature and how elements interact and balance one another reveals God’s intentionality. He then discussed natural occurrences, such as solar flares, gradual changes in tidal heights, and shifts in the earth’s rotation speed as manifestations of our world’s and solar system’s entropy. Ross posed a question those skeptical of God sometimes ask: Why would a loving creator choose a torturous process of life and death and change? In short, God designed the earth to handle the changes humans and other created beings, like animals, create in the environment. “Life impacts erosion, carbon burial rates, atmospheric chemistry, crust, soul and the planet’s reflectivity,” said Ross. Eroding silicates balance greenhouse gases, which subsequently regulate the sun’s brightness, and other chemical levels in the earth’s soil help suppress poisonous, soluble metals to the point their levels are low enough for human’s to go unaffected. “It takes someone who knows the sun’s and moon’s and earth’s future physics’ to remove no longer compensating life, and replace it with just the right life, at just the right time, at just the right amount in just the right locations,” said Ross. The world, said Ross, may not be able to support life much longer.